Minister of MOCIE Mr. Lee Hee-Beom speaks at EUCCK seminar. The Korean government currently provides one-on-one services to foreign investors through project managers of Invest Korea. Other incentives include the Cash Grant, stronger incentives in taxation and industrial land and eased requirements for the designation of the Foreign Investment Zone. "Korea and European countries have fostered political, diplomatic, and economic relations for a period that now spans well over a century. Whenever Korea faced difficult times, the countries of Europe extended a helping hand to Korea. Like one true friend does for another just like the proverb 'A friend in need is a friend indeed,'" said South Korean Minister for Commerce, Industry and Energy, Mr. Lee Hee-Beom in a luncheon speech held by EUCCK (EU Chamber of Commerce in Korea) at the Grand Hyatt Hotel in Seoul on March 8, 2005. First, EU (European Union) expansion and integration ensures peace and stability not only for EU, but it promises to usher in a new global era of peace and stability. 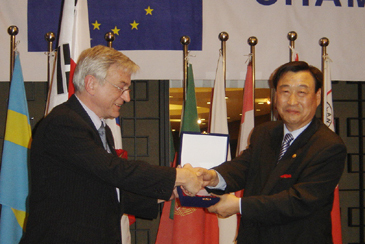 Mr. Dieter Brinkmann, EUCCK vice president confers a plaque of appreciation to MOCIE Minister Lee Hee-Beom speaks at a seminar held by EUCCK. Also, EU expansion and integration will bring about free trade within the EU, and this signals the coming of an era of global free trade. These two results from EU expansion and integration will lead to economic growth and prosperity for the EU, and this will then translate into global economic growth and prosperity. Mr. Dieter Brinkmann, Vice president of The European Union Chamber of Commerce in Korea (EUCCK), welcomed everyone for the seminar titled "Business Environment in Korea- MOCIE's Perspectives for 2005." EUCCK was formed by a group of individual business executives from various EU companies based in Korea, with initial financial support from the European Commission in February 1986. 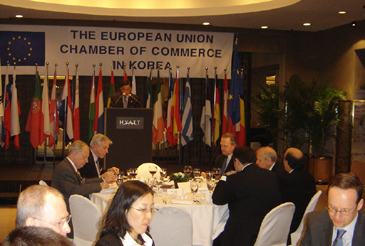 The purpose of the chamber is to help in developing trade, commercial and industrial relations between the EU and Korea. The chamber paves the way for and fosters contacts between interested business circles of the 25 EU member states and the Korean Peninsula. 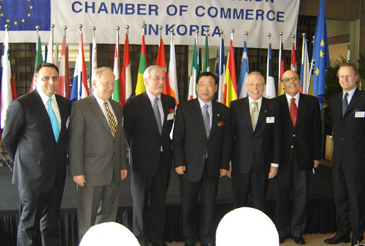 MOCIE Minister Lee Hee-Beom (center) poses with other dignitaries during a seminar organized by EUCCK. Before presenting the speech, Mr. Lee Hee-Beom joined the lunch with distinguished guests, dining on a delicious menu. As a scholar from the different universities both from home and abroad, Mr. Lee pointed out some important issues related to the business infrastructure of Korea. "Through the five rounds of ASEM (Asia-Europe Meeting) meetings since 1996, we have formed solid partnerships in trade, investment, mutual security, and culture, among others. In particular, Korea recognizes the importance of strengthening cooperation with the EU, as demonstrated by Korea hosting the 3rd ASEM meeting in 2000," Lee said. 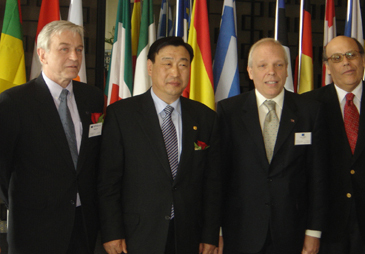 MOCIE Minister Lee Hee-Beom (second from left) poses with other dignitaries during a seminar organized by EUCCK. "Also, unlike in the past when the Korea-EU relationship was such that it was only Korea to benefit from the relationship, but with expanding two-way trade and investment, today's Korea-EU ties are quickly progressing into a mutually beneficial relationship," added Lee. The Korea-EU trade volume is also increasing rapidly. In 2004, trade volume rose to $56.1 billion US from $32.9 billion US in 1999. As of 2004, EU's total investment into Korea was $30.8 billion US, which accounts for some 30 percent of the total foreign investment in Korea. 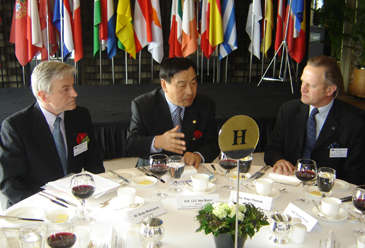 MOCIE Minister Lee Hee-Beom (center) talks with other dignitaries during a seminar organized by EUCCK. Externally, MOCIE will lay the groundwork to develop Korea into a leading trading nation. The current trading environment is characterized by the WTO (World Trade Organization) multilateral system and regionalism of economics, which has given rise to FTAs (Free Trade Agreement). However, Korea will also actively take part in WTO DDA (Doha Development Agenda) negotiations. By the end of last year, 48 improvement measures were undertaken out of a total of 151 so far identified. This year, MOCIE will identified and cure an additional 30 areas needed for improvement. It has contributed 10 billion won for the establishment of Yongsan Foreign School in which the groundbreaking ceremony will be held in early April of this year. Foreign-invested companies will get the facility from the Seoul Metropolitan Area, investment incentives, such as industrial sites and tax reduction, a total of 65.5 billion won will be set aside to further designate Foreign Investment Zones, performance –- based compensation will be adopted for Project Managers so that stronger post-investment services could be given. 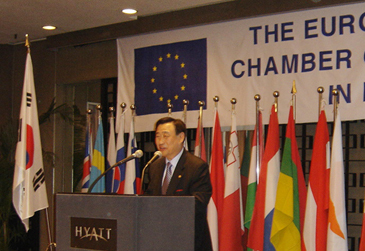 MOCIE Minister Lee Hee-Beom on podium speaks while other dignitaries listen during a seminar organized by EUCCK. Mentioning the last visit of South Korean President Roh Moo-Hyun to some of the European countries, Mr. Lee Hee-Beom said, "To maintain the momentum, President Roh is expected to continue to make official visits to more European countries, in order to further cement the growing Korea-EU partnership." Minister Lee ended his speech with an anecdote to highlight the importance of promoting cooperation and development between Korea and EU. "The Czar of Russia had written a telegraph about what to be done to a notorious criminal. It read, 'Pardon impossible-comma-to be sent to Siberia.' Finding the telegraph, however, the merciful czarina changed the location of comma to read, 'Pardon-comma-impossible to be sent to Siberia.' Just as the man's fate changed with a simple thing as the location of a comma, in similar respects this is what is needed now in the Korea-EU relationship," said Lee.